When Denis’ family moved out from North London, they’d wanted to find a youth side for their football-mad son to play in. Twenty-three years after his wife “rang the wrong club” – now Saints’ Chairman – Denis Mair stood chatting warmly with me about the place that accidentally became his second home. 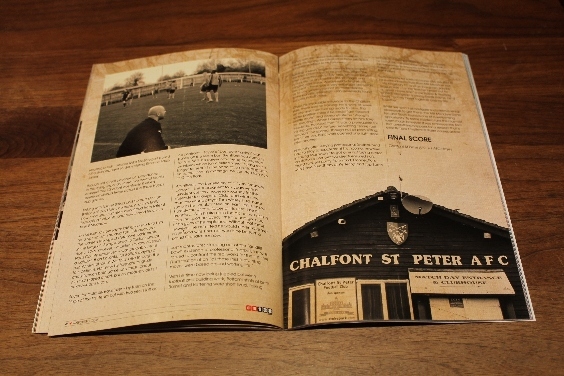 Six years prior to that remarkable phone call; on Wednesday 3rd April 1985 – the night after beating West Ham 5-0 at Vicarage Road – top division Watford broke off from their gruelling schedule of five league games in just eighteen days, to play a benefit match, away against a Chalfont St Peter team, six divisions below them. This special match was held for just one man; local resident and Harrods bombing victim, PC Jon Gordon who had lost both legs in the blast two years earlier. Winning with goals from Rostron and Taylor, that first Watford visit ensured both the only ever encounter between the two clubs and, a record Mill Meadow attendance of 2032 that has never been surpassed. 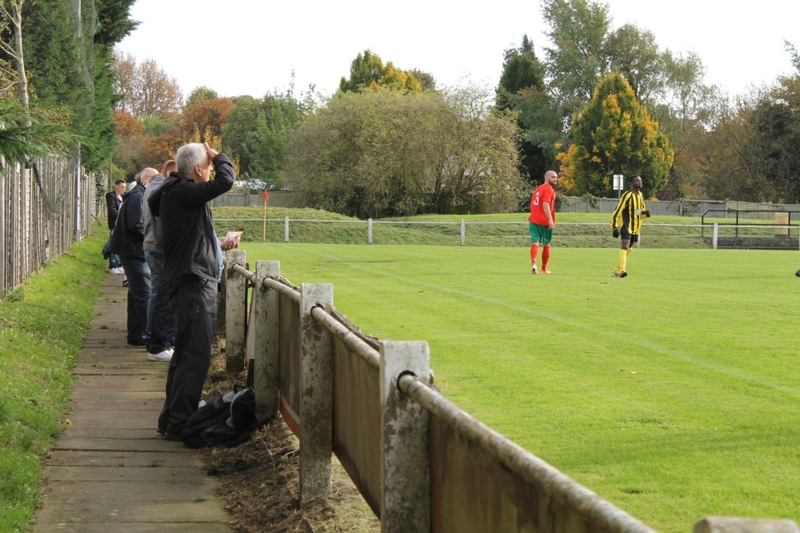 Although of a very different era, the enduring goodwill from that one night – towards Graham Taylor’s side – was still evident as I strolled about the rural Mill Meadow ground, talking to locals prior to kick-off. Whilst most fans naturally congregated by the welcoming clubhouse – which doubles as a nursery during the week – some could also be found in the sunshine opposite, stood by a tree line which formed a typically picturesque Chiltern boundary between us and nearby houses. To the left a practice pitch was separated, by a small strip of temporary covered seats whilst, behind the goal to the right, a very healthy stand has been erected; one I was told that is favoured by Ted Buxton, a regular in these parts. 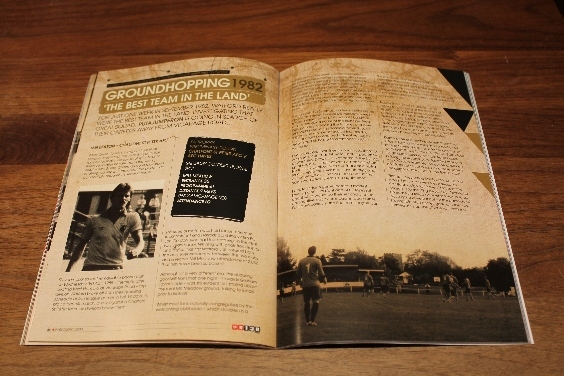 Though that 1985 contest – a few months before Ian Bolton’s arrival here at Mill Meadow – was totally unique; today’s fixture could be just as vital for the good name of the clubs involved. With both experiencing the fortunes of a lower mid-table season, the financial possibilities of a good cup run meant everything. Residing in what could be deemed affluent yet rugby areas, small clubs like Chalfont need such successes. Five years ago, their finest cup run took them to within seconds of a FA Vase Final appearance at Wembley. Drawing 3-3 at home in the first leg; up at Glossop Chalfont were 2-1 ahead when, North End equalised with the final kick of extra time. Despite this near miss – eventually going out on penalties – that was one cup run The Saints would like to emulate again, soon. 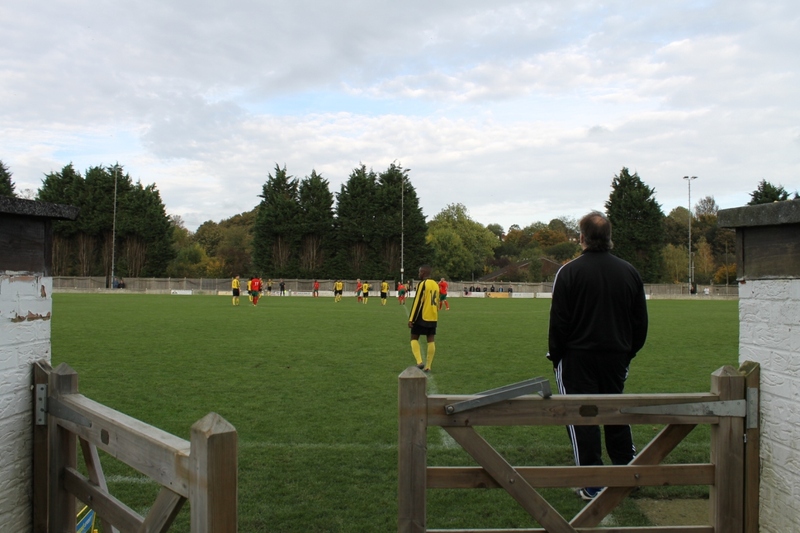 Back to today’s game, before a modest loyal support, Chalfont and AFC Hayes set about what would be their second of three consecutive cup fixtures against each other. Four days earlier, in the Southern League Cup, the pair could only be separated on penalties. Three days after my visit only a single goal would decide the eventual replay of this FA Trophy fixture. 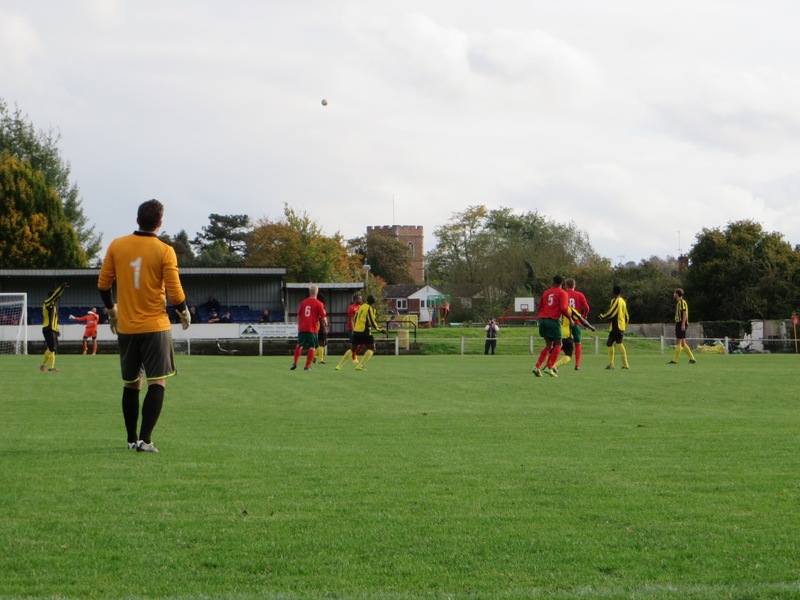 Draw or not – sandwiched in the middle – this encounter was a commendable effort in which both sides had chances to win. Now without Scott Fitzgerald – who retired for plumbing at the end of last season – with a few more recent team changes on board, Chalfont started quite brightly. Disappointingly, other than a few long range attempts, the dogged defensive lines held firm at both ends. After the break however, both the game and its attackers broke free of their shackles. 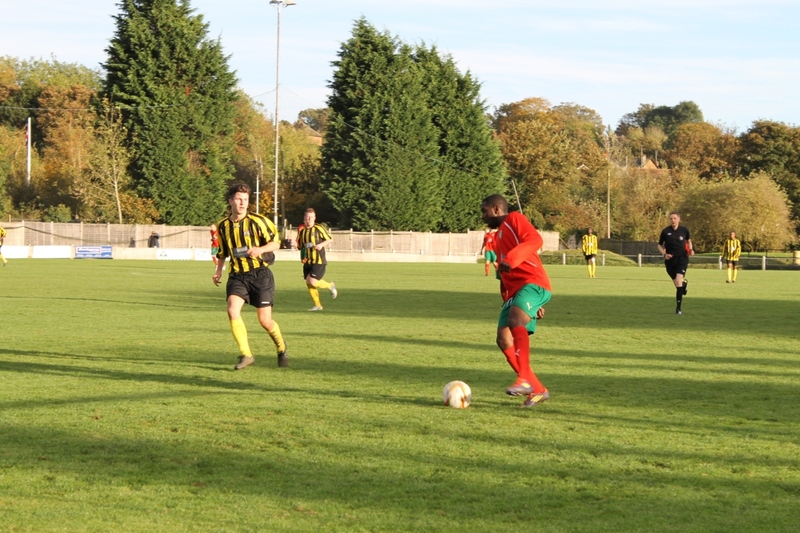 Demonstrating a parity between these two sides; following Toby Akinjirin’s far post effort putting Hayes ahead, ten minutes later Saints were level through Remmel Clarke. Both close range goals culminated from tremendous passing moves and both illustrated that, only inches would separate the eventual winners and losers of this cup tie. None more so was this demonstrated than in the final minute. First up – preventing Saints winning – a fine Adam Louth cross was met adeptly by Chalfont’s reigning “Players Player Of The Season”. Connecting beautifully, Alex Paine unleashed a fierce drive which would surely have gone in were it not for the backside of his captain Alan Hedley getting in the way. Immediately up the other end – from the resulting break – keeper Mike McEntegart pulled off a stunning save to deny visiting Ricardo Faux-James. 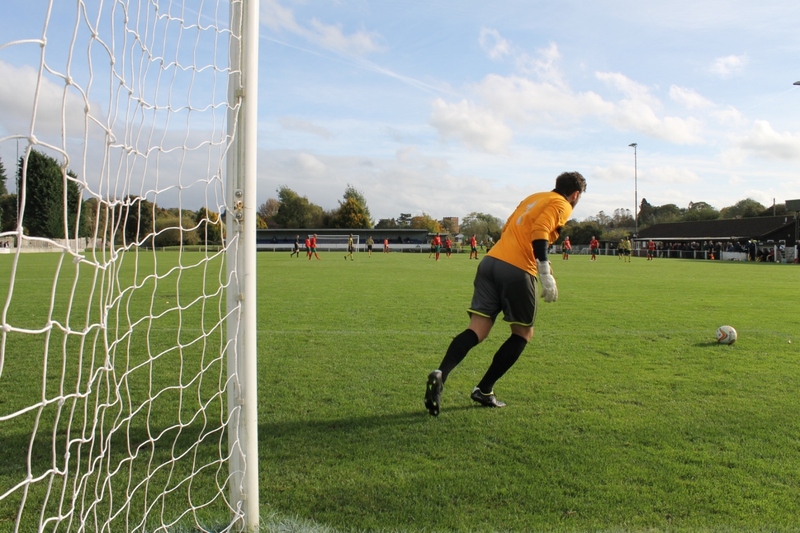 Though not a real devotee of “providence”; in the dying seconds, these two pivotal blocks ensured that Chalfont eventually finished eventual winners twice across the three Hayes cup games. 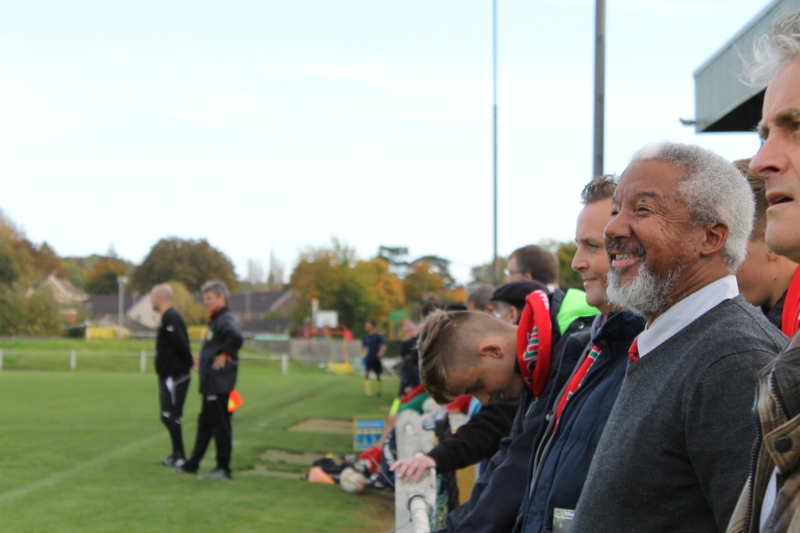 Talking with former Saints and Hornets star Ian Bolton just days later, he explained modestly how he’d also ultimately benefitted from fateful footballing incidents, and how they’d lead him to Mill Meadow. Ian described how Taylor jokingly once told him he’d signed both he and Sam Ellis because “he wanted the ugliest defensive partnership in the league”. Being loaned to Taylor’s Lincoln side in 1976 however – a division below his then Notts County employers – was probably more a catalyst, than his looks, for Bolton playing a hugely pivotal role in Watford’s rise through the four divisions. Naturally his foresight to guide and influence both game and those about him also played a part but, he modestly didn’t acknowledge those. Seven fantastic seasons later – by then on the fringe of the first team but with two years left on his contract – Taylor’s “best ever signing” was pulled off the team bus. Brentford had come in for him. With his career now being punctuated by injuries which Ian clarified were “taking much longer to heal”; in the hope of jump-starting both his career and his marriage, he decided to move to Griffin Park. Admittedly the beneficiary of a “very fortunate career” – the subsequent four years were a turbulent yet very necessary journey for the defender to navigate. Older and wiser now than the young player Tom Walley had made run until he “couldn’t feel his legs”, Ian surmised humbly the pivotal forces of his brief time at Brentford. With his life up in the air, he was drifting from the sport he loved; “the fire had gone out of his game” he explained. Without that move however, he admitted he would never have met his second wife Tina, nor would he be such a proud Grandfather now. Just months later, stepping out of the “gold fish bowl” existence of professional football, Ian was forced to confront the real world for the first time. From that point on “all those [his] footballing moves were based around working life”. 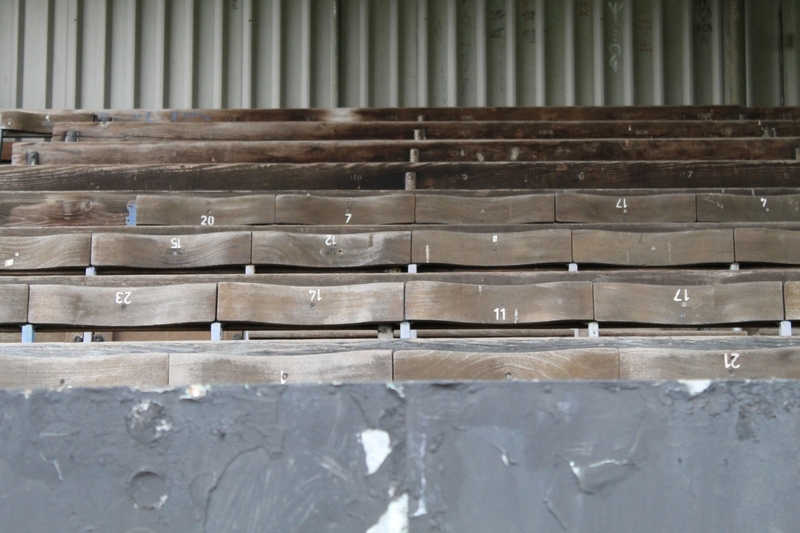 With his time now being juggled between football and building work, Bolton’s stints at both Barnet and Kettering were short lived. Talking frankly with Ian about this period however, clearly his signing for Chalfont St Peter heralded a stabilising effect to his fortunes. Building a luxury estate in nearby Beaconsfield, the then Chairman ran his own firm. When the offer came through in July 1985, Ian soon began a dual life; as an Assistant Site Manager and ranging right back. Always ready to give 100% – there was a very enjoyable discussion as to why players cannot do more despite some pundits’ inference – Ian deservedly found success in both roles. Given his invaluable influence to the Chalfont side, there was no training; he’d work all week on site and then turn up ready to play. The wider position meant he could “get forward a little more” and demonstrate his “strength for shooting”. When I asked if they let him take free kicks, he joked that “it was a prerequisite for joining any club” before recounting “some real crackers” he scored. Though not all plain sailing; from then on, hard work opened one right door after another. Naturally after leaving professional football he’d had to play to supplement his income however, in taking four years “to get over not being a pro” Ian Bolton’s competitive streak ensured he’s found success away from sport. Connections with Dave Needham at Kettering and Top Score at Oxford United lead him into a world of sales, his home life calmed down and to top it all, Ian beginning to enjoy his football even more. Being a salesman “ignited everything for me” he illuminated. Switching site for sales of course also resulted in his eventual departure from Mill Meadow but – via Kingsbury FC and an Evergreen Sunday league side – by the time he turned out for a “great Hayes side” (now Hayes & Yeading United) alongside a young Derek Payne, he’d really “got my head together and my life together”. Whilst we won’t all navigate such monumental crossroads to get there, the Mill Meadow Denis, Ian and Scott, found is one of a welcoming opportunity. 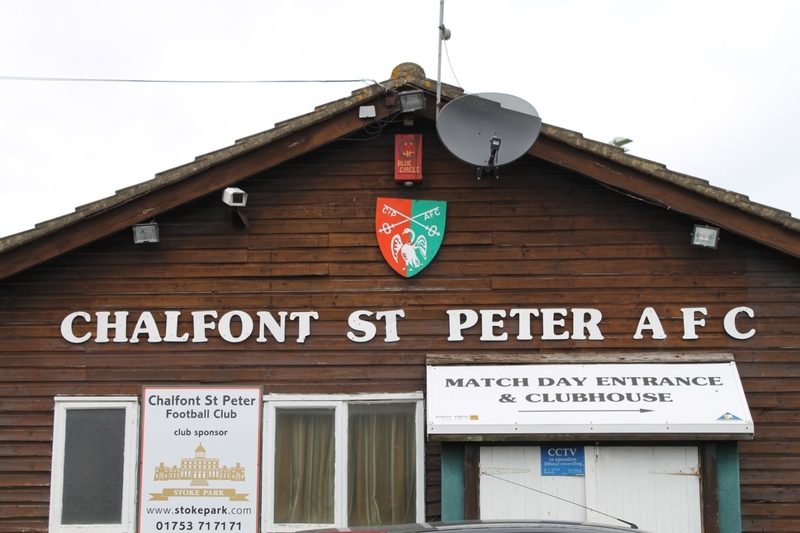 To some modern fans this may not seem much however, if you embrace the fact that everything happens for a reason; that is exactly how Chalfont St Peter comes across. This entry was posted in #WFC1982, 2014-2015, FA Trophy and tagged AFC Hayes, Chalfont St Peter AFC, Denis Mair, FA Trophy, Graham Taylor, Ian Bolton, Mill Meadow, Preliminary Round, Saints, Scott Fitzgerald, Southern League, Tom Walley, Watford FC. Bookmark the permalink.